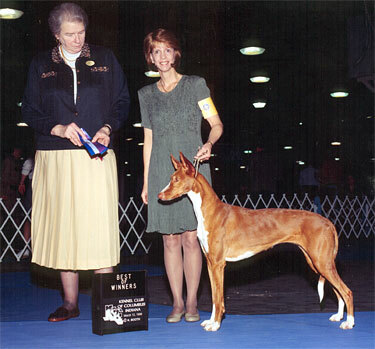 Ibizan Hound - Cierra | Canine Training<p>by Mystic Moon, Inc.
Dual CH. Serandida's Elusive Sorocco "Cierra"
Look at all these titles! A Sight Hound? Yep! earning 3 consecutive scores of 197, 195 1/2, 199. 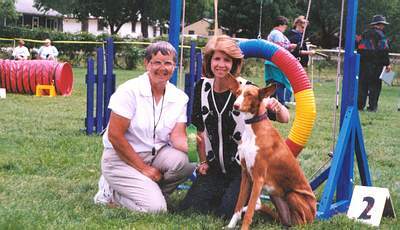 Schutzhund BH Obedience/Temperament No way? Yes! A Sight Hound. There were "traditional Schutzhund / Personal Protection competitor" there, that did not qualify that day. (off the coast of Spain) for the hunting of wild game. They are very cat like in attitude, and are known to be independent.